The Mooseman – a very unique game experience – AiPT! I’m always interested in odd games. I’ve been playing video games for about 35 years, since my parents brought home an Atari 2600, and in that time I’ve played every permutation of game that exists. I have my favorites of course, and entire genres I tend to play nearly every entry in, but with all that time and experience under my belt an odd game is a very interesting option. Enter The Mooseman, by Morteshka, a game that could easily be mistaken for a history lesson, or a stroll through a museum. It’s not a traditional game in any sense. Feeling like a combination of puzzle and walking simulator, you are presented with a mythological story set in Chud – a tribal area of today’s northwestern Russia. These Perm Chud’ tribal myths deal with a Mooseman, a shaman of sorts who can see past the reality of the world, and into the hidden spirit world by putting a moose skull over his face. 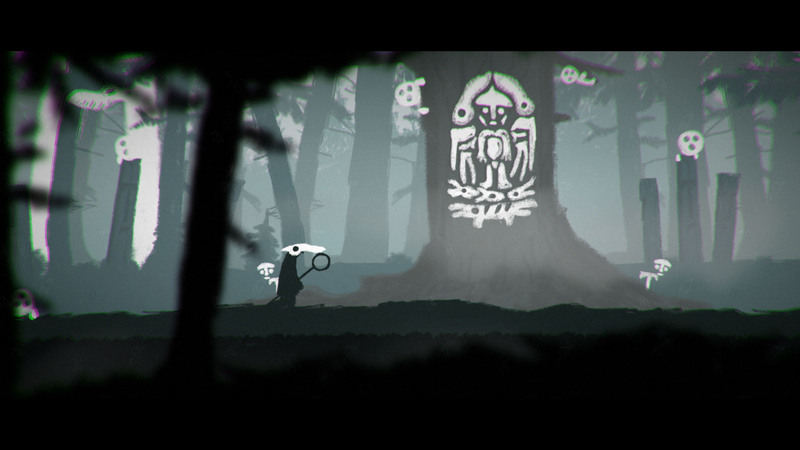 To play the game, you walk to the right and put on your mooseman skull at various times to solve puzzles and find hidden items via both the real and spirit world. To make this feel even less “game” esque, there’s even a button you can click to toggle on automatic walking, disconnecting you from playing during long lulls where a lot of information is presented. There’s no run button. Mooseman chugs along at a very slow pace, watching the spirit world drop hints about hidden artifacts and secret puzzles. You can stroll right by puzzles, without any warning or notification (as I did), eventually getting to the end of a level without even realizing you left something behind. In my case, I only realized there were puzzles in certain areas by looking at the achievement list on my Xbox. All of the above seems slightly negative, right? Walking simulator seems to have a bad connotation in today’s gaming industry, and the odd setting and weird pagan iconography might put quite a few people off. I truly enjoyed everything this game had to offer. First of all, the setting is crazy interesting. My knowledge of Slavic/Finnish mythology is very light, but ever since digging into the Witcher series, I’ve found my curiosity piqued to find out more. This game is a slow drip of information and belief systems, in a way that’s fun to consume. The slow stroll of your character means you have enough time to really think about the culture and its customs, and how incredibly difficult it must have been to even stay alive during a dark and cold Russian winter. Second, the graphics are stellar. It’s a very basic 2D, but the use of light and dark are stellar. When you pop your moose skull on your face and see an entire cave system light up with huge pictographs or constallations, it’s very effective. Also, since there’s no real need for fast twitch responses, you get to drink in these images, and think of the simple tools that would have been used to create them. As a non-expert in these realms, there could be quite a bit of creative license here but I found the backgrounds excellent and really set the tone and mood of this bleak, pagan landscape. Finally, on the positive side, this truly does feel like a museum experience. Having strolled through many a dedicated space while listening to a phone app or a provided audio experience, this could sit side by side in those environments. Kids too tired to roam through the entire Natural History Museum with you? What if they could play a video game for a hour and learn something the same way? I could easily see a game like this leveraged to teach the Fortnite generation more about their own ethnic backgrounds, if you put a unique skin at the end of it, of course. Still, there’s some negatives here. It’s a pretty short experience, which actually might be a positive for those that are not interested in the walking simulators, but I found myself just getting to a point where I was feeling the slow pace when it was over. That same slow pace was actually quite frustrating at first glance though – as I’m used to having a sprint button in nearly every game. I was chomping at the bit as I slowly plodded through forests and over bridges. It took me the entire first level to just sit back and enjoy the presentation. Outside of the simplicity of the controls, doing nearly anything else in the game is difficult. The attention to detail was absolutely around the story and visuals, and the menus and selection processes were left to last. Several clicks to learn about an artifact, and several clicks to get back out was an annoying break in the smooth narrative otherwise. Overall, I think Morteshka has an interesting title, that needs a little refinement to truly become a great “game.” This genre will never be for everyone, as the slow process and esoteric subject matter are probably not of interest to a great deal of the COD and Halo players of the world, but I say give these weird games a chance. The industry is not just for shooters and racers, so any support of some of the more strange and out there entries can only do good things for this entertainment division. Overall, while not a traditional "game" by any means, it's an entertaining and odd entry that feels like a stroll through a museum of unknown mythology. A bite sized lesson - great way to introduce new cultures to the gaming audience.